Origami Animal Sculpture book by John Szinger comes with an instructional DVD and will be released from Tuttle Publishing on July 22, 2014. 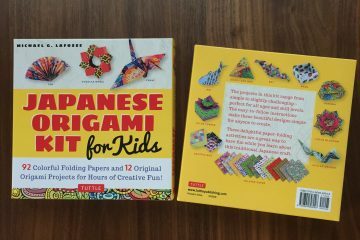 As it’s implied by the title and the photos, this book is not meant to be for origami beginners. It is for intermediate to advance folders who are looking to tackle some challenging models. 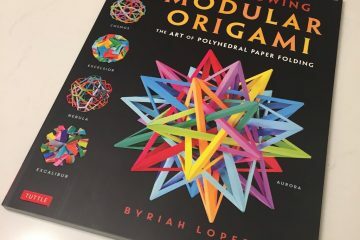 If you like to wet-fold your origami models, I think most of the models in this book would be fantastic as wet-folded sculptures. I must admit that I do not usually challenge myself to advance models or wet-fold just for pleasure, but I very much enjoyed tackling the models in this book so far. The first two models that I folded are Foxy Fox and Narwhal, during an 1.5 hour flight. I folded both of these out of 10×10 origami paper. The author gives suggested paper size for each model based on the complexity level, which is helpful. I had never seen an origami narwhal model before and was very excited to see this fascinating creature in the form of origami! It’s hard to believe that narwhals really exist because they look like unicorns of the sea. I also folded a Bull Walrus out of 10×10 black origami paper. I think this photo taken at at the poolside location came out pretty cool. It makes him look lively, as if he is about to jump in the water. Here is another photo that I took of the Foxy Fox model, with the redwoods in the background. Foxes actually do live in the woods around there, so it seemed appropriate. This Adirondack Chair below is not an animal model, but it is included in the book. I folded out of a 6×6 brown origami paper and set it in the middle of wild flowers. I call it a tiny chair for a fairy. This would be a cute model to put in a dollhouse. I enjoyed taking the pictures in these appropriate settings, thanks to my family members who live in the beautiful spot. The models came out looking more lively than just in plain background. I am still folding more models from this book, but perhaps I will wait to share them until they look more presentable. I think that each model in this book is aesthetically refined and accurately depicting the characteristics, so they deserve quality paper, precise folds and beautiful presentations. I would give a 5-star rating on this book! The models are pleasantly challenging and provide good practice for aspiring folders like myself, who need to work on difficult folding techniques, such as crimp and sink folds. Lastly, I want to share my favorite photo from this book, below. It looks like these cephalopods are having a meeting, with the blue Giant Squid being the leader of the group. It cracks me up. 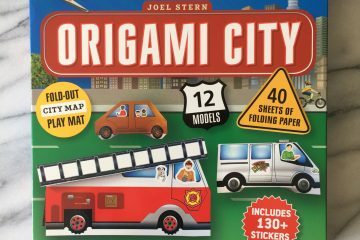 All of the example models shown in the book are folded by the authors, John Szinger. Photographs by Bob Plotkin. You can pre-order this book directly from Tuttle Publishing, and also from most major book retailers such as Amazon and Powell’s. As mentioned earlier, it will come out on July 22nd.